Fans of Santa Monica’s Big Blue Bus and local history should both enjoy this short film featuring both. The film showcases a day in the life of a bus driver, George Staley, as he drives his route on Big Blue Bus line 3, which served Lincoln Boulevard then as it does today (though the route has been altered somewhat since then). But the film reveals more than just the basics of being a bus driver in 1960s Santa Monica. It also captures a (rather idealized) snapshot of life in the “medium sized city” a half century ago. “Below us is a residential area in a medium sized city,” the narrator explains in the opening shot of the short film. “Most of the people have a common problem. During an average day, many of them have to travel to some other part [of the city]. Some travel to the downtown section to work… Many make the trips in private automobiles and leave them in parking lots,” the narrator continues. “But not everyone who needs to travel from one part of the city to another has a car available to make the trip,” he says by way of explaining the importance of the work of the bus driver. This particular little narration also happens to explain the underlying problem of post-war city planning — sprawl — but that’s another conversation for another time. The opening shot takes the viewer from the Wilmont neighborhood over the downtown before turning eastward. The clock tower building is visible, surrounded by a sea of parking lots and commercial buildings. 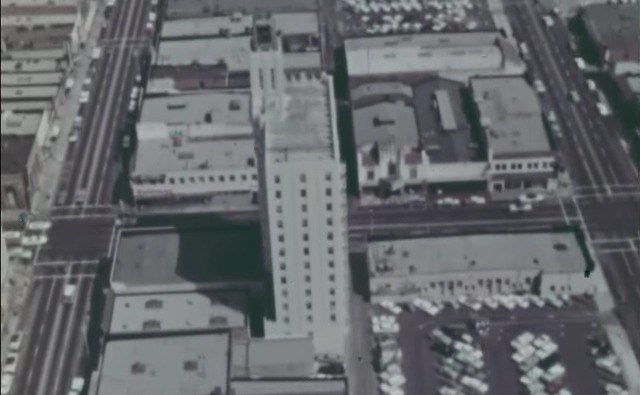 As the camera veers left, the viewer catches a glimpse of the “triangle” at the intersection of Main Street and Colorado as well as the Sears building. Where the Santa Monica Place mall currently stands the viewer can see a cluster of commercial buildings. They would be replaced with the first iteration of the Santa Monica Place in the late 1970s. Another feature that jumps out about the film is that it has a few reminders that Santa Monica, often misremembered by some as once a “sleepy beach town” was, in fact, an industrial center in the 1960s with a residential population of 83,249 (compared to about 92,000 today). At one point, the film’s narrator explains that two men boarding the bus are getting off the night shift at a factory. Later in the film, a full bus is shown approaching a stop and the narrator remarks that a number of passenger disembark because they work at this plant. The words “System Development Corporation” can be seen on the building as the passengers walk toward it. SDC was a major aerospace manufacturer based in Santa Monica, which until the 1970s, was a major hub for aerospace manufacturing. Beside SDC, there was Donald Douglas, which had been a major manufacture of planes during World War Two and then of ballistic missiles during the Cold War. Lest some get carried away with the spirit of the “good ol’ days,” it’s also worth noting that the first people of color that appear in the film come at the end and are the people who clean the bus after Staley finishes his shift.